In this episode, we sit down with Alana Barfield. She’s a survival reality TV start and certified professional organizer. 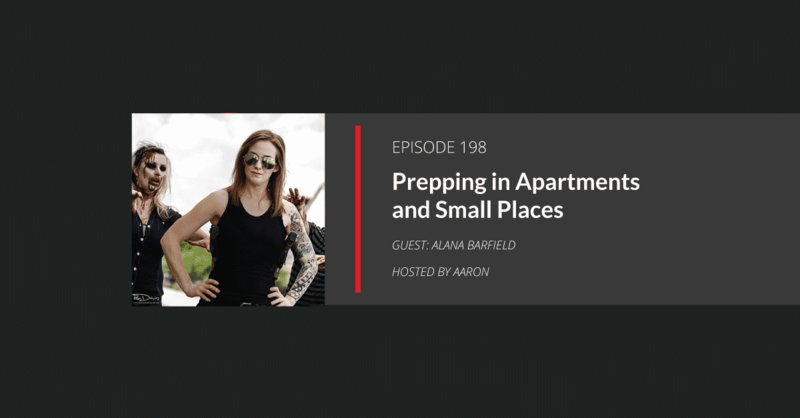 We discuss how to get the most out of your square footage for apartment prepping. Plus, Alana shares a cool James Bond-like DYI hidden space project with you. An estimated 70 percent of the US population live in apartments. And the average apartment size is estimated to be 982 square feet. That means the majority of preppers in the United States don’t have a lot of space for storage of supplies. To be specific, we can assume, based on current statistics, 6,678,000 of US preppers are trying to store supplies and address security concerns in less than half what the average single family home affords. But this problem of space isn’t exclusive to prepping in apartments. Those of us in single family homes often find ourselves searching for ideas, tips, and hacks for maximizing the space we have. And we’re all always looking to keep what we’ve stored hidden from prying eyes. So this episode covers a lot of bases with Alana’s best advice for doing more with less for all of us.